In 1985, two displaced Romanian families came to Marshfield, Missouri, having defected from the Soviet bloc. At the time, my dad (the guy in the back row with the stripey tie) was minister of music and youth at First Baptist Marshfield. All the teenagers you see crammed into the picture were members of his youth group. 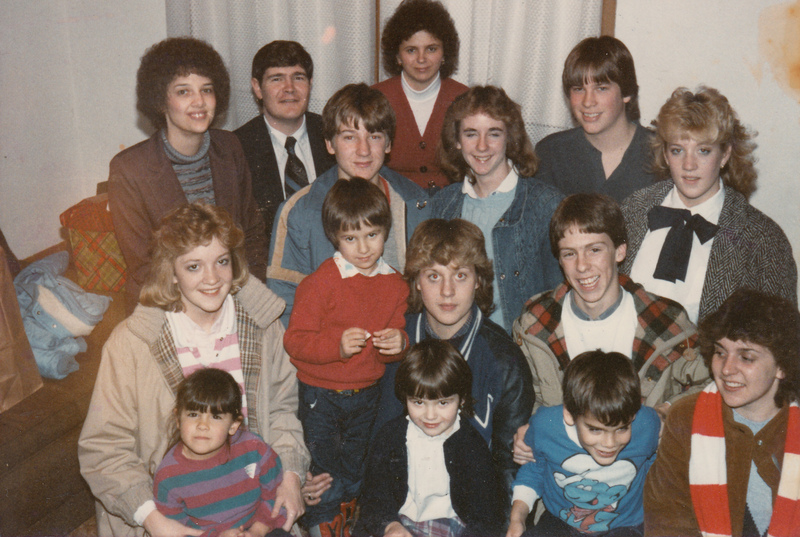 Scattered throughout are the Borza family–mother Maria in the back center, son Audie in the second row, and daughter Diana beside me and my Smurf. That Christmas (which is when this photo was taken), First Baptist decided to pull together gifts and supplies for the newly arrived families, to help them feel more connected to our community. And I had an idea: I raided my toy box. There was this Transformers car (or Go-Bots–I don’t remember which), a little blue convertible number, that I absolutely loved, and I seized on that as the perfect gift. I don’t remember if Mom wrapped it or not; I just remember the feeling of happiness that came with handing it over to my new friend. Strong enough that today, almost thirty years after the fact, it’s still clear as a bell in my mind. The world is full of so many lonely souls. That moment of connection with the Borza boy was an eight-year-old’s first inkling of the truth of that statement. At the time, I didn’t know from communism or dictatorship or political repression. It would be years before I could formulate a decent definition of the Soviet Union, and by the time I could it didn’t even exist anymore. But here was this kid, not so different from me, a kid who enjoyed Christmas presents and little toy cars every bit as much as I did. A kid who, given other circumstances, might have been me, and I him. And for the briefest of spaces, our lives intertwined, became one. And I learned, albeit unconsciously. As I told my friend upon relating the story, I couldn’t even remember the family’s name, not until I read it off the back of the photo. Couldn’t remember the year. Just the faces. And the feeling. Of connection. Of camaraderie. Of compassion. Perhaps this explains the fervor with which I approach the ongoing confrontation between fear and human decency that is the Syrian refugee crisis. I have been there and done that. And I would gladly do it again. In a heartbeat. My friendship with the Borza kids (there was even some teasing about a young crush I might or might not have had on Diana) is a foundational memory, one of the basic building blocks of who I am today. Lest I be misunderstood, this is not about religion or spirituality. The part played in this story by my dad’s church is purely incidental, the conduit whereby I was connected with the Other, who turned out to be not quite as Other as we sometimes expect. Really, this is about recognition: staring into the face of a stranger only to discover it’s your own face in disguise. A refugee by any other name…is Me. The events of the last few days have yanked this memory back into the forefront of my brain. I’m glad for that: it keeps my humanity alive, in the face of overwhelming odds. It reminds me of the blood that runs, and the hearts that beat alike, in their chests and mine. We are brothers, sisters, prójimos. We are One. I understand the fear; I understand the hatred, the instinct that begs for the immediate release of violent and fiery retaliation. These voices whisper to me as much as to anyone else. Which is why this is so important: freedom is meaningless until we willingly set it aside for the sake of others. Courage is just a word until we face a threat, and act anyway. The Borzas call to me from the past, and the Syrians call to me in the present. What is my answer? I am here. I can’t just urge my governor to reverse his stance on this issue unless I’m willing to step up and reach out. I am here. These people need friends, shelter, guidance, hands extended in welcome. I am here. Governor Abbott: Need a sponsor?